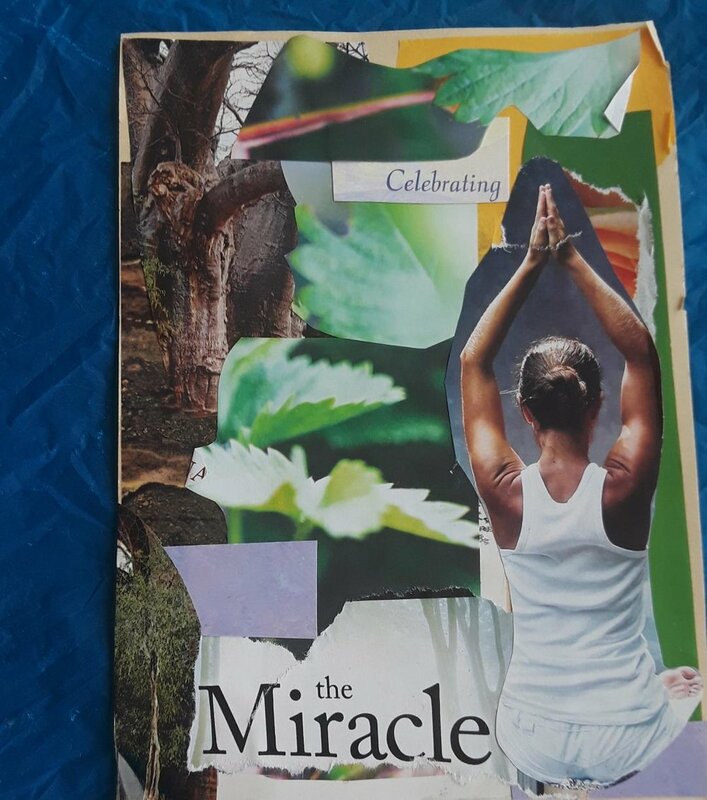 Book created by a collage participant after an 8-week collage class. Permission granted to reprint here. Below is a meditation on inviting compassion. This is an example of a meditation that accompanies each mediation or collage class. Classes can include such themes as strengthening intuition, mental clarity, neutral discernment in decision-making; grace and compassion, integrating inner resistance, and creativity expansion for creativity; Group collaboration that increases connection and group cohesion. Day-long classes can include Kundalini Yoga in the morning, and collage visioning, writing, and shared reflections in the afternoon. Size gatherings vary from 20 to 100 participants and all-day; weekend; weekly in 6-, 8- or 13-week series. Contact me for details regarding corporate packages and rates. 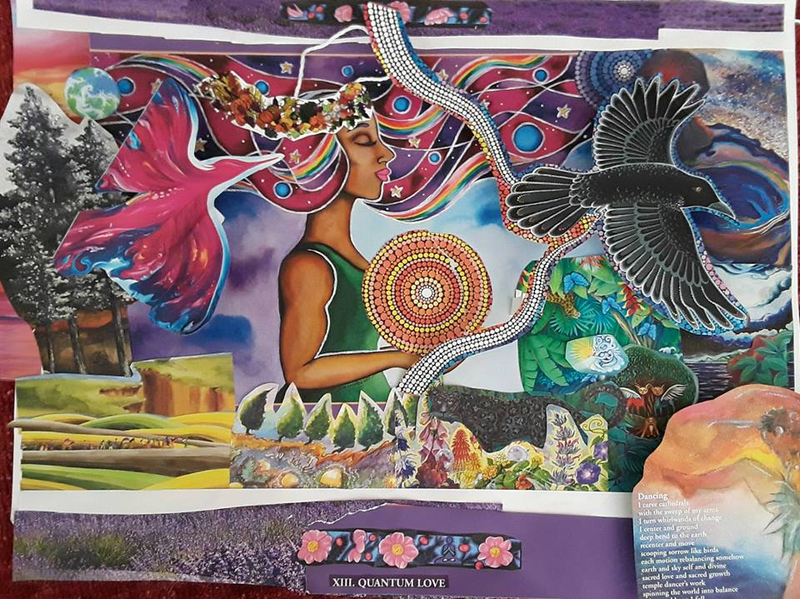 My name is Tina Karagulian, and for over 30 years I have facilitated collage and visioning gatherings that assist others to access, express, and integrate the inner creative sparks in their lives. I am also a Kundalini Yoga Instructor, offering a scientific yoga technology that empowers individuals to be more focused in mind, body, and spirit, enabling them to achieve their creative goals with increased precision and intuition. I create safe and welcoming spaces to access inner creativity and wisdom— strengthening individuals, groups, corporations, and communities. What do participants receive from my classes? · COMMUNITY: through the multiplier effect, an expanded and enhanced supportive group dynamic is created. · MEDITATION: an opportunity to slow down, go inward, and create the necessary space to hear our own creative wisdom. · COLLAGE & WRITING: gather and ground our inner creative wisdom into form, through images, writing, and assembly. · SHARING: By speaking aloud life-giving experiences in this process, participants feel heard, empowered, and integrated. · YOGA: through the use of sound (chant, music, and instrumentation), breath, and Kundalini Yoga movement, participants more deeply ground their creative experiences within body, mind, and spirit. Whether you are a writer, artist, team member, or project manager, exploring these creative channels opens and supports you in your own creative endeavors, and opens blocked creative processes. Inspiring new areas of creativity. 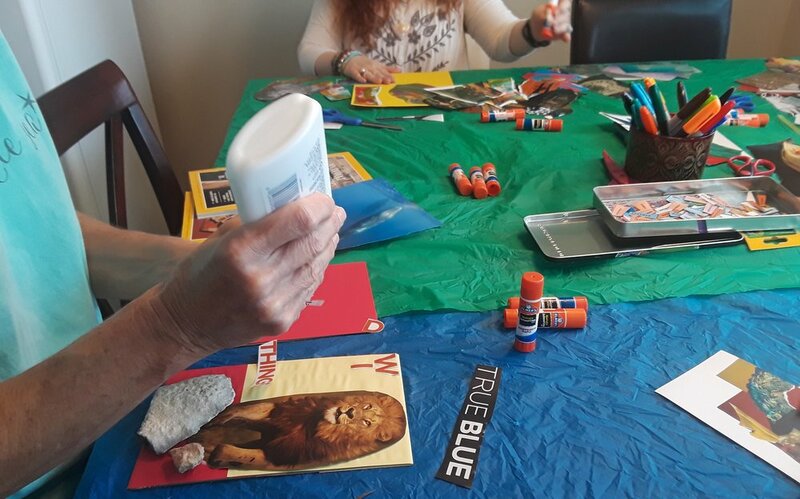 Collage or visioning with images that are already created frees participants to assemble, draw connections, and integrate in new ways. Through guided meditation, I create safe and welcoming spaces to meet challenging moments with grace, compassion, and presence, as our creative sparks come alive again. When sharing inner guidance and intuition in groups that are open to transformation, both sides of the brain balance and supportive empowerment naturally occurs, for both individuals and groups. The comprehensive and scientific technology of Kundalini Yoga brings balance to the nervous system, stimulates the pituitary gland as it increases intuition, and increases oxygen in the body. Decision-making is increased, a centered sense of well-being deepens, and creativity is grounded as a way of life.